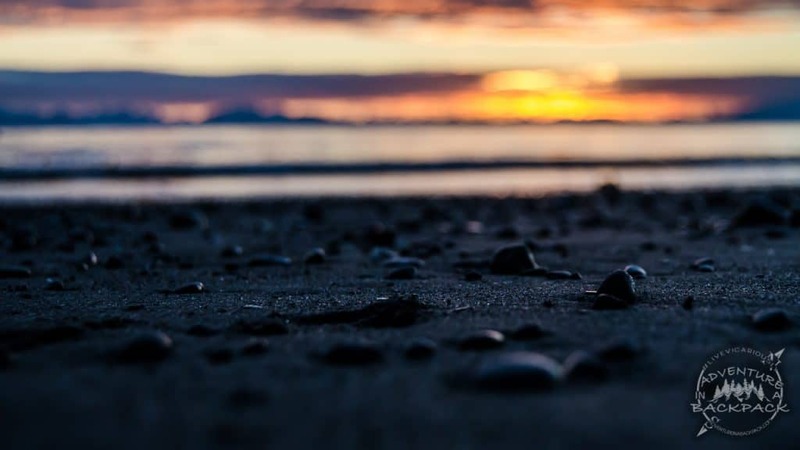 As we ventured down the Kenai Peninsula, we were excited to visit Homer, as we had heard from several different people that it was a great town. While Homer was fun, we actually stayed just 10 miles outside of Homer in a town called Anchor Point. We really enjoyed our time in Anchor Point and would highly recommend the area to anyone wanting to see wildlife, beaches, and great camping. Anchor Point is on the Cook Inlet, just a few miles up the inlet from Homer. Being the lesser-known area, it’s not as crowded and definitely not commercialized. 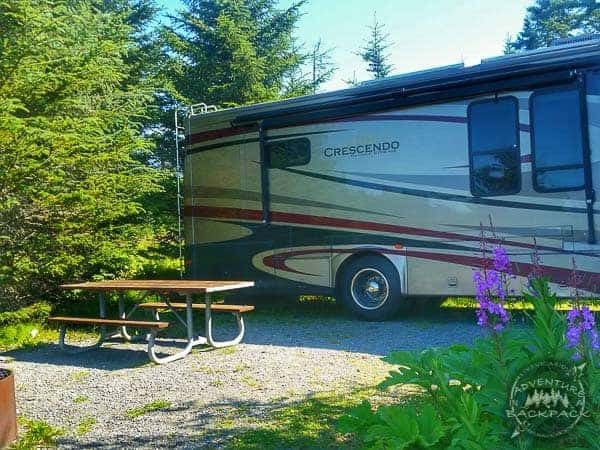 However, there are several state campgrounds that make for a great base camp while you explore Homer as well as Anchor Point. 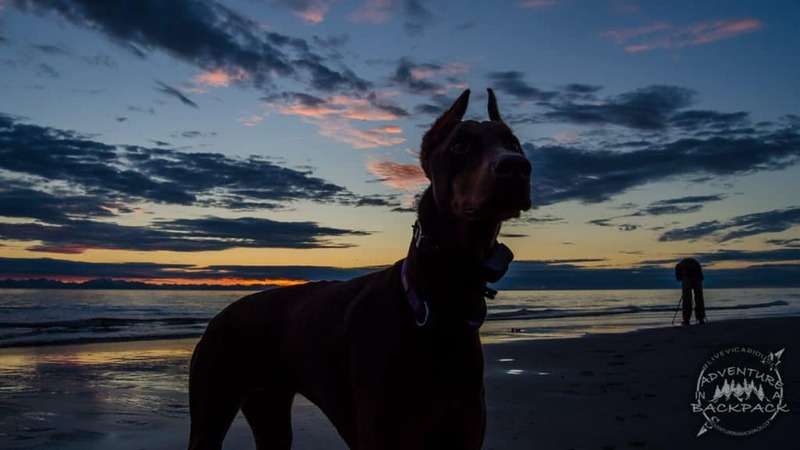 As soon as we got set up for the first night, we grabbed the pups and went for a walk along the beach. It was a cool, breezy night, but not cold. The breeze was just enough to bring the smell of salt, sand, and fish up to your nose and surround you with a sense of ocean. We let Pyros off of her leash to run in the sand and waves, but kept Sparta on a tight leash due to the abundance of eagles in the area! Pyros had never been to a beach before and had never experienced waves crashing on the sand. She had also not experienced saltwater before! Getting excited, she ran to the water, took a big drink, and immediately let it all fall out of her mouth. Meanwhile, she looks at us like we just poisoned the water! 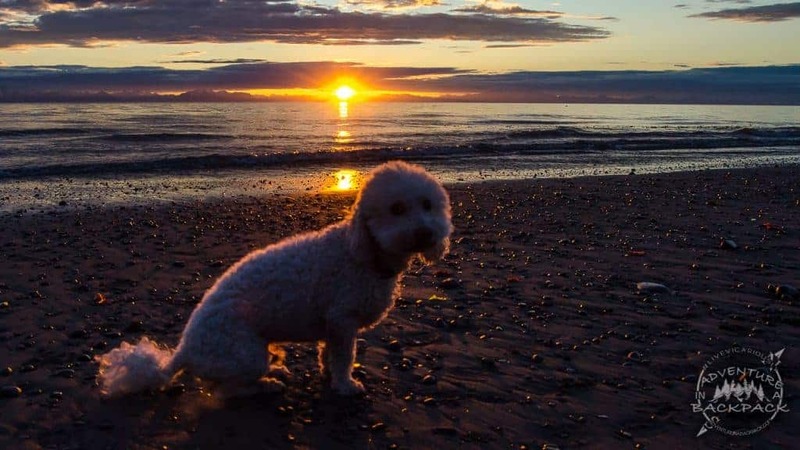 She eventually figured out that it was a bad idea to try to drink the water, and conceded to just running around the shoreline playing with the waves. There is a boat ramp on Anchor Point as well, but it is not your typical boat launch. This boat launch is what they called a tractor launch. Due to the tides and sand, there is no way to put in a paved boat ramp. Instead, the tractor is hooked up to your boat trailer and pulls your boat across the sand and launches it into the water. It is an incredibly interesting thing to watch – and WOW those tractor tires are big (taller than Steph)! We enjoyed watching the guys working, bringing boats in and out of the water all day long. As I briefly mentioned, there was an abundance of eagles in Anchor Point. The boats that are launched from Anchor Point are mainly fishing boats (seems to be mainly locals). When they come back to the beach, they clean their fish right on the beach, leaving scraps for the birds to eat. Because of this and the natural habitat surrounding the area, there is an abundance of food for eagles to feast on. Our first evening in Anchor Point, we were astounded by the number of bald and golden eagles around the area. 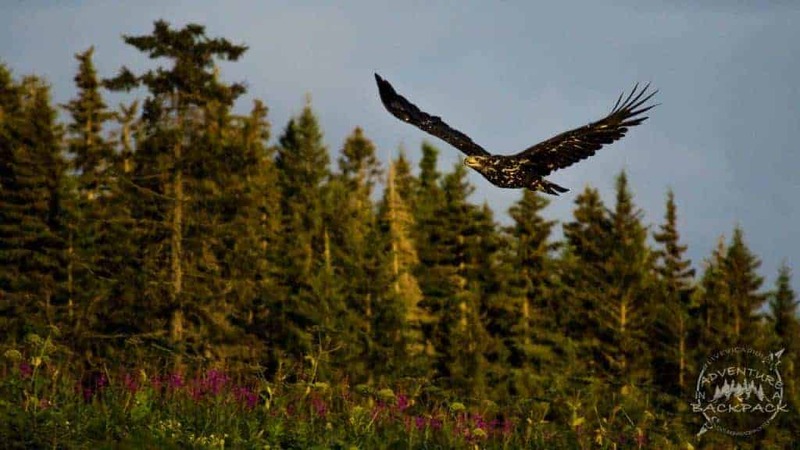 Needless to say, we couldn’t wait to get our cameras out and get some photos of the eagles. 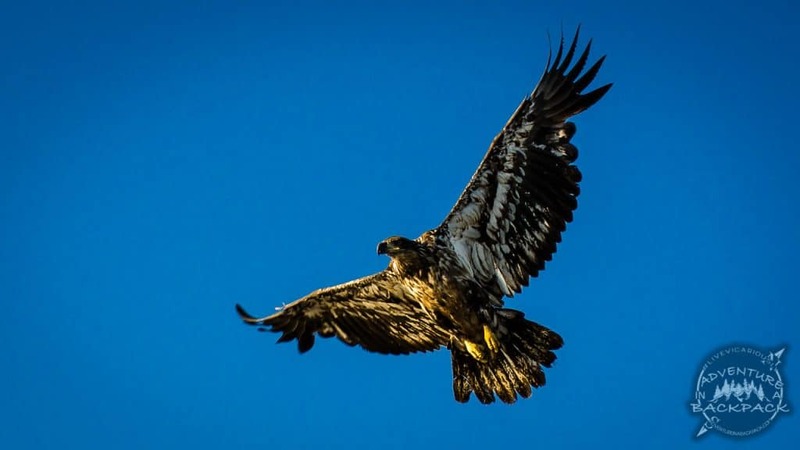 Over the week that we stayed in Anchor Point, we were able to capture some outstanding shots of eagles, both bald eagles and golden eagles. 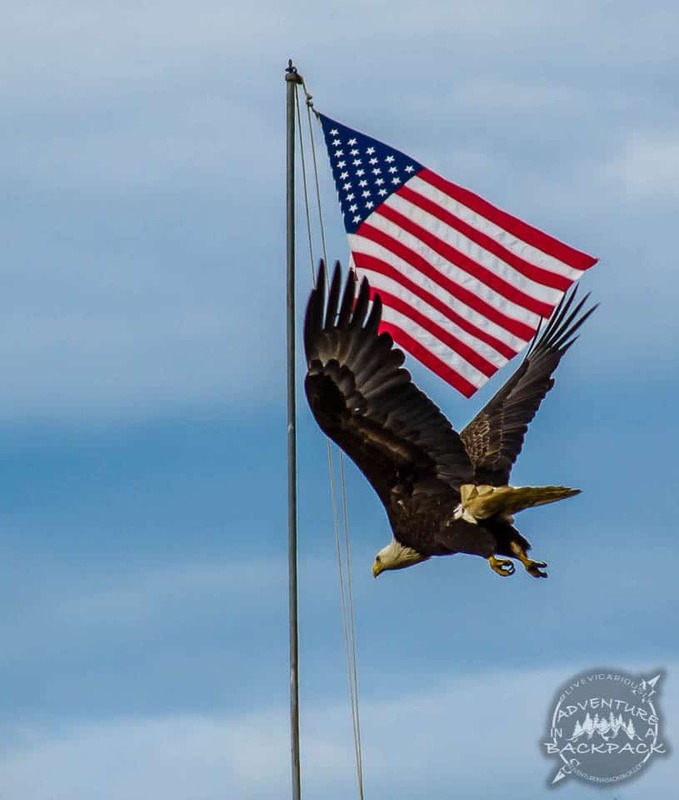 I never thought I would hear myself say “I don't need any more pictures of eagles,” but I did in Anchor Point! We were a couple of happy photographers! This was almost too perfect! America! Eagles were a plenty in Anchor Point Alaska! How about another eagle? Wow! 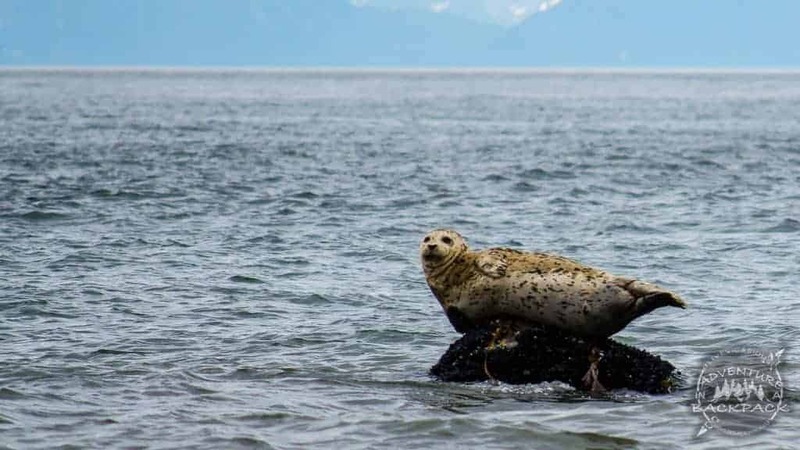 Of course, eagles weren’t the only things frequenting the Cook Inlet near Anchor Point. One evening, we saw a very picturesque seal hanging out on a rock not too far off shore. We were able to snap a few pictures of him as well. In the evenings, we could see the little bobbing heads of more seals in the water as well. We enjoyed watching them peek out of the water just a tiny bit before dipping back under a wave out of sight. Well hello there, Mr. Seal! We decided to finally give a go at fishing in Alaska while we were in Anchor Point. While we didn’t want to hire a commercial charter for a fishing trip, we did get licenses and researched on our own to determine where to fish and the best methods of catching fish. While we didn’t really expect to catch anything off the shore of Anchor Point, it was a fun evening activity to spend some time outside. We also tried a few spots in Homer as well as the Anchor River, with no luck. All we caught in that time was a bunch of Irish Lords, which apparently taste like mud. Luckily we got that insider info from a local before we tried it ourselves! 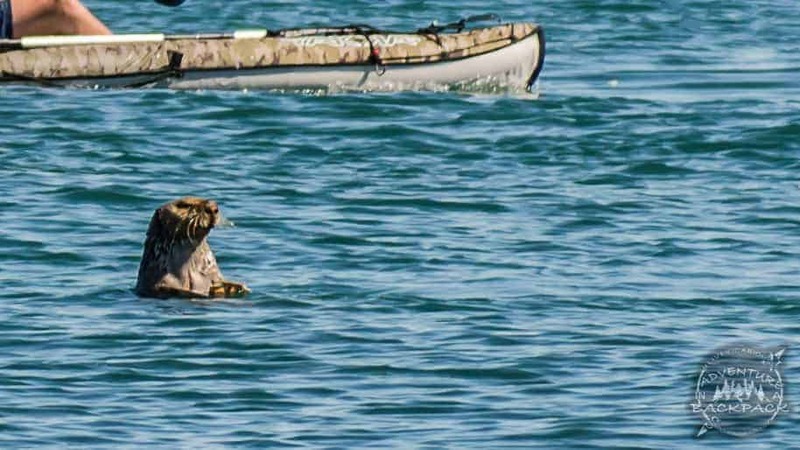 This sea otter had way better luck at catching fish than we did! We drove through Kenai on our way to Seward from Homer, and while we were driving around exploring, we happened upon a dip netting event. We had heard of dip netting and we had seen the dip nets, but we still really weren’t sure what you were supposed to do with those huge nets. We stumbled upon a beach where there was a full-on dip net event going on, and we were able to get in for an hour to watch. So what is dip netting? Essentially, you take a huge fishing net on a very long handle (I’d say most were about 10-feet long, although they varied) and basically stand in the water with your net in front of you and wait for a fish to swim into it. Doesn’t sound like much of a sport, does it? Well, we didn’t really think so either, but boy does it work! As we watched for 15 or 20 minutes, we saw as people pulled in one after another after another of king salmon. We got to talk to some locals and they say that it does definitely vary on the time of year and luck as to how well it works, and each year is different. 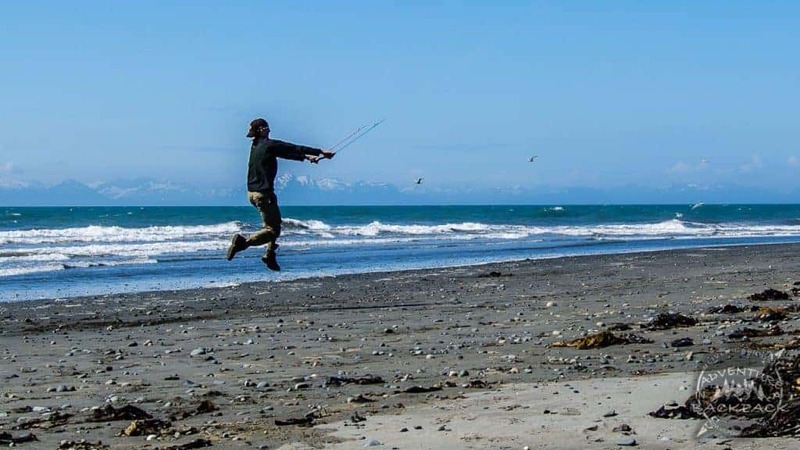 Seems like this year was a good one for fishing in Kenai! It would’ve been fun to catch some salmon while we were in Alaska, but that wasn’t really our goal for the trip. So it was a fun activity and maybe next time we come to Alaska, we’ll be more diligent about fishing so we can say we caught salmon in Alaska! We camped in Anchor Point for about six or seven days, and that allowed us plenty of time to explore and adventure around the area. One clear and calm day, we decided to get out and paddle on the Cook Inlet, just down from our campsite. We grabbed the kayaks and launched them from the beach, paddling against the wind to start out. We paddled, drifted back to where we started, then repeated a few times. The day was sunny and mostly calm out, and we didn’t paddle too hard to wear ourselves out. We just enjoyed the time on the water, watching the birds, the waves, and the sea life. From our kayaks, the water was clear enough to see the sea bottom for most of our paddle. We didn’t get too far offshore, so the water wasn’t more than 15 feet deep at any given time. We could see halibut below but, although we did drop fishing lines in the water, we never caught one. We also saw several crab and we’re pretty sure they were stealing our bait while we were fishing as well. We paddled through a school of tiny jellyfish, too! They were so adorable, but we were definitely glad we weren’t in the water with them! They looked like little pieces of cotton from a cottonwood tree at first, but upon further inspection they were definitely jellyfish. When we first arrived in Anchor Point, we were hoping to get a spot in the Halibut Campground, which is the closest campground to the beach. However, there are only nine RV campsites, and when we arrived they were all taken. So we stayed in one of the other campgrounds (there are three that accommodate RVs and two that are tent-only) for the first night. The next morning, we scouted out the Halibut Campground again right before checkout time (noon). Luckily, a few RVs had left and we snagged a great campsite in the prime location. The campsites are very pretty with lots of trees for privacy. The campsites at Halibut Campground were beautiful! The campgrounds are all $15/night, which we felt was well worth it for being right on the beach. We stayed there enjoying the eagles, the sunsets on the beach, and the sounds of waves for six nights. It was a great area, but we did think six nights was a tad too long to linger in the area – at least for us! 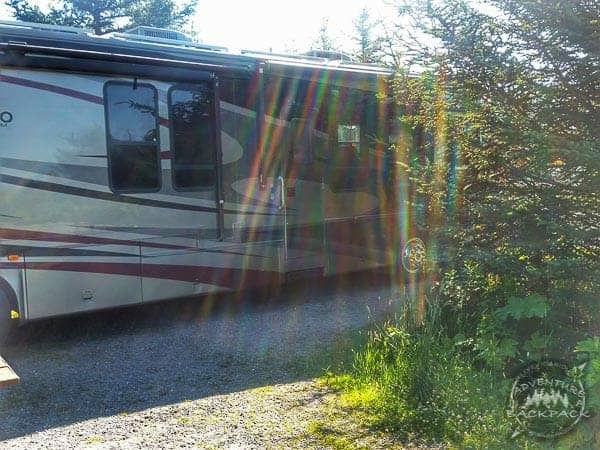 Camping in Anchor Point is a great alternative to Homer Alaska, which is much more crowded. We really enjoyed our time in Anchor Point and would definitely suggest it to anyone coming to visit Homer. Homer was a neat little town and good to drive into a couple of times to explore, but it was very touristy and cramped. The RV Parks and RV Campgrounds in Homer were all pretty much gravel parking lots with as many spaces crammed in as possible. Although the ocean views are great in those areas, we wouldn’t have enjoyed being packed in like sardines while trying to enjoy the area. Anchor Point, on the other hand, was spaced well and was quiet enough that there was no hurry to leave. The beach was pristine and there were not many people on it at any given time. It made the whole experience quite spectacular. 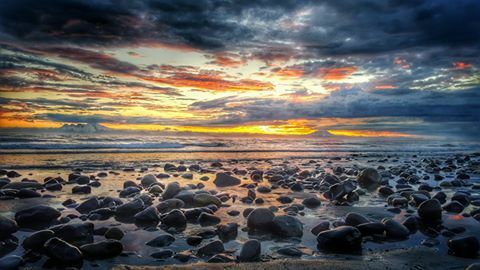 Beautiful sunset on a beautiful beach on the Cook Inlet. 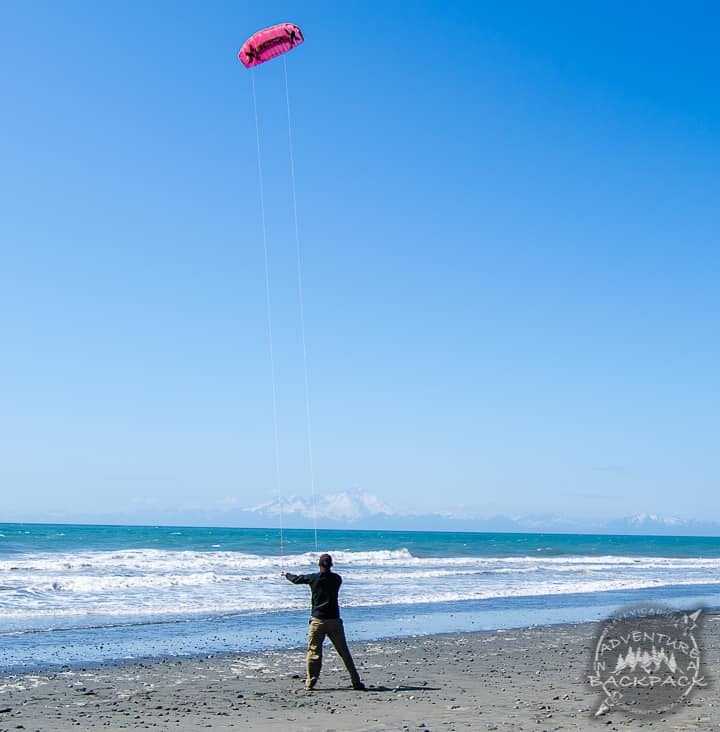 Nate also tried his hand at kite surfing! 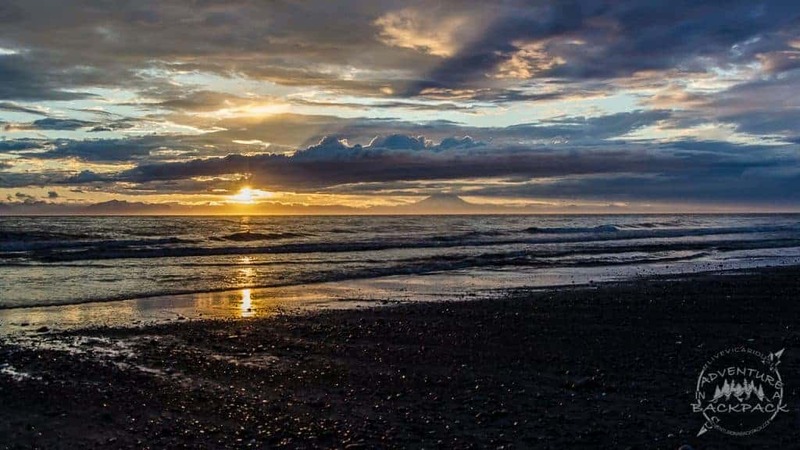 If you are ever in the area, we suggest you check out Anchor Point Alaska! Be sure to subscribe below for more insights and suggestions on travel and adventures. Until next time, #LiveVicariously!